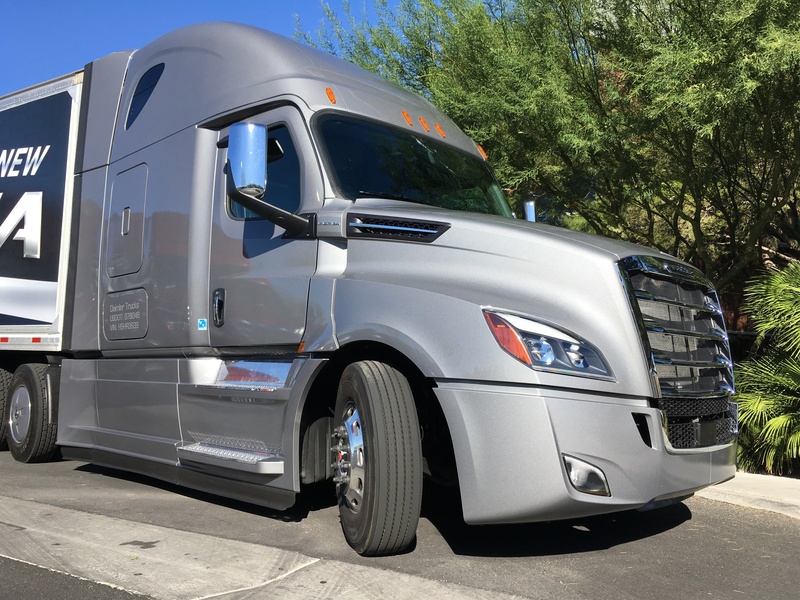 LAS VEGAS, Nev. – It takes some courage to take the industry’s best-selling truck and to completely reinvent it, but that’s exactly what Freightliner has done with its new Cascadia. 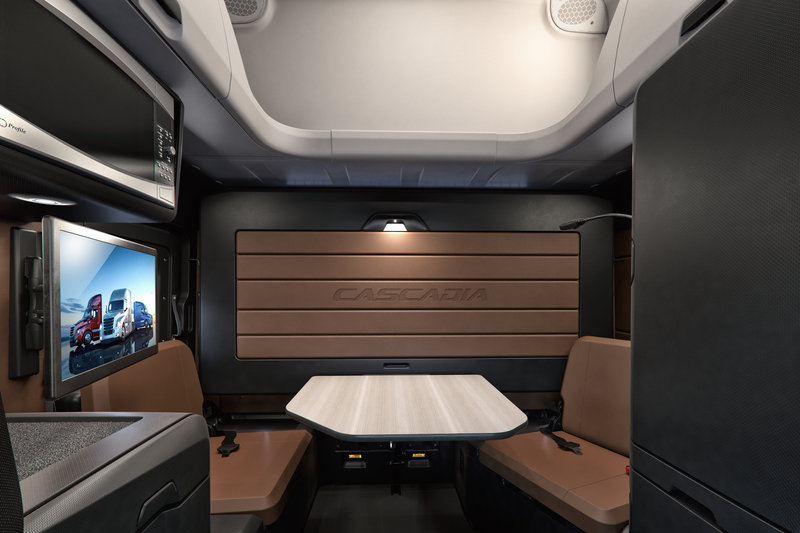 The new Cascadia has been in development since late 2011, an unusually long production cycle, giving the company the opportunity to conduct extensive field testing and to ensure a smooth rollout. 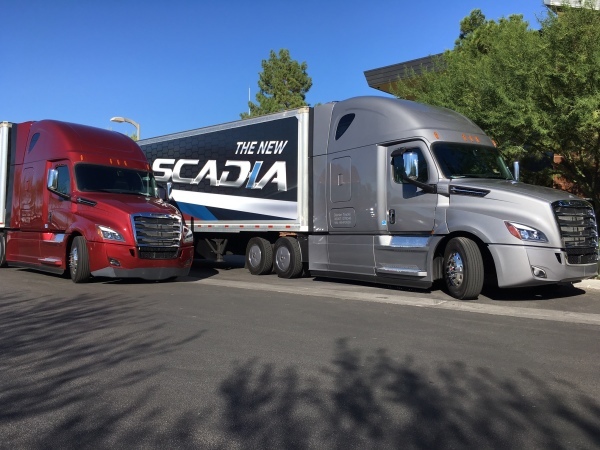 I recently had the opportunity to drive two new Cascadias and they performed exceptionally well on a nearly three-hour drive from Las Vegas into California and back. Both trucks, despite being pre-production units, were dialed in and provided a superb driving experience. This is a completely new truck, not just a product update. It has been redesigned top to bottom, inside and out. Let’s start with the exterior. Freightliner is promising an 8% fuel economy improvement over its Cascadia Evolution, and about half of that is due to aerodynamic enhancements. The AeroX package features a low clearance air dam, drive wheel fairings and long flex extenders along the rear of the cab. Both the Aero and AeroX packages feature more aerodynamic mirrors and door seals. The remaining fuel economy gain comes from the integrated Detroit powertrain; the DD15 engine, DT12 automated manual transmission and Detroit rear axles all received improvements. The new Cascadia is more modern and distinctive looking than its predecessor. It seems to have borrowed some design cues from Freightliner’s autonomous Inspiration Truck, but in reality, it was the other way around. The new Cascadia was already in development and so, unbeknownst to us at the time, the Inspiration Truck actually offered a hint of what was to come in the new Cascadia. The new Cascadia will improve a driver’s life. The sleeper has been completely redesigned to make better use of space. 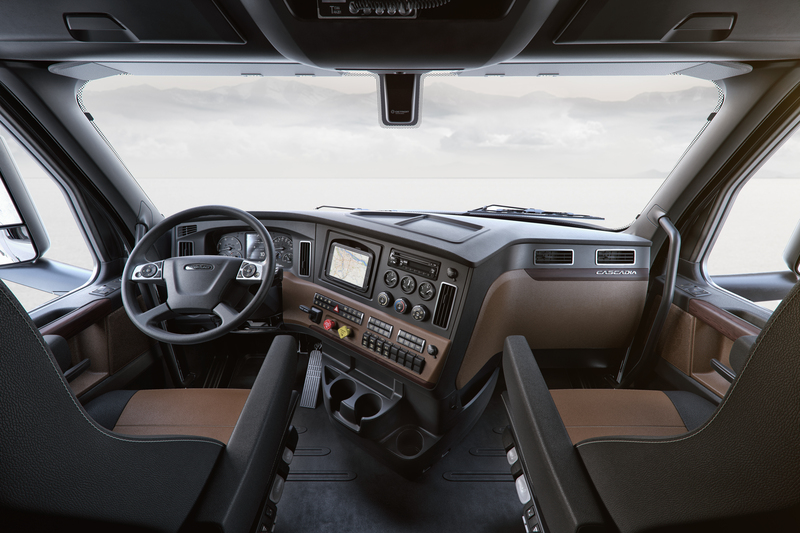 With the trucking industry’s focus on health and wellness, Freightliner designers added a larger fridge with a surface area that can be used for food prep or cooking equipment. In consultations with drivers, it was discovered that the upper bunk isn’t often used for sleeping – it’s normally used for storage. So designers built into the new sleeper proper storage around the perimeter of the ceiling with tie-downs that can be used to secure duffel bags or storage bins. This opens up headroom and gives an open, loft-type space, not to mention loads of extra storage. With the lower bunk folded up, two seats and a table provide a comfortable and functional dining area. “The other feedback we got, was this feeling that the truck was like a cave and when you turned the lights on they were too bright,” Faulkner explained. Freightliner’s answer to this was to install dimmable LED lighting in the ceiling, which provides a more natural, indirect glow. Brighter dome lights are also available when more light is needed. This attention to detail carries to the front of the truck. The instrument panel is cleaner and more logically laid out. Electrical switches are along the upper row and air switches below. “It’s very intuitive about what you need to find and easy to find them when you need them,” Faulkner reasoned. Above those is an area that can be used to install whatever telematics device the customer is using. “We’ve allowed for the easy integration of the display without having to go through a lot of rework or tearing up of the dash,” Faulkner explained. One of the biggest upgrades is the driver display, which through the use of vibrant colors makes it easy to find at a glance the information you are looking for. There’s a ton of information packed into this display, including everything that pertains to the Detroit Assurance 4.0 suite of active safety systems. No longer is a separate monitor required on the B-panel to display details such as following distance. Visibility out of the new Cascadia has gotten better. The mirrors were moved slightly to accomplish this and a one-piece windshield and side windows allow a better view of the space around the truck. Out on the highway, the truck performed spectacularly on a route that took us south on US Route 95 to Searchlight, Nevada, west along 164 – some good grades along this section – and then back to Vegas on I-15. The 400-hp, 1,750 lb.-ft. rated DD15 pulled the grades better than you’d think possible from just 400 horses. More fleets are spec’ing their engines this way, Faulkner explained. I spent the majority of the time in cruise control and was pleasantly surprised at how intelligent the adaptive cruise system was. When a car would pull in front of me the truck wouldn’t back off if the car was travelling faster than I was, even if my following distance was momentarily compromised. This made for smooth cruising, even in traffic. Keeping the truck in cruise control is good for fuel efficiency. The adaptive cruise system also has the ability to look ahead at changes in terrain and to adjust speed to maximize efficiency when approaching and descending hills. Because it comes pre-loaded with all this data, it can save fuel on the very first trip, unlike some other systems in the market that must first encounter a grade before committing it to memory. Detroit Assurance 4.0 offers additional active safety features including lane departure warnings and even pedestrian detection. The entire system has been smartly integrated into the vehicle so as to eliminate distraction. You don’t know it’s there until you need it or go looking for it on the driver display. The ride was exceptionally smooth and quiet and the new Cascadia responded well during lane changing and cornering. The DT12 never missed a beat and the engine brake is integrated into the shifter stalk for easy access while driving. This engine brake has a growl to it and produced ample power to hold me back on the longest and steepest downhill sections I encountered. The steering column-mounted engine brake is even available on trucks with manual transmissions. This is a fantastic truck to drive. It would be wrong to think of it as a fleet truck. Fleets will buy plenty of them, because of the 8% fuel economy improvement versus the Cascadia Evolution and the fact drivers will love to drive it. But the term fleet truck can have a negative connotation to it. It implies bare bones. Boring. This is a technology-packed luxury truck that’s a real treat to drive. And because it will be produced in such high volumes, there’s the potential here to bring affordability to the premium truck segment. We drove these two new Cascadias from Las Vegas to California and back in early October.